Dr.R.Rejikumar, Post Graduate Student in Homoeopathic Philosophy,Govt. homoeopathic Medical College,Thiruvananthapuram, is well known to every body for his enthusiastic involvement in social and academics credentials. He had written many articles in magazines and presented scientific papers. Here Dr.Rejikumar evaluates the evolution on dynamic concept with Homoeopathic Science. The discovery of Homoeopathic healing art by our master was a revolutionary downlink of ideas from the mysterious universe. Dr. Samuel Hahnemann was truly far ahead of his time with sound philosophy and intuition. Perhaps the convergence of the concept of vital force to health and disease was one among his novel contributions. The idea of vital force has been described throughout history with remarkable similarity from writer to writer. Paracelsus, the Renaissance alchemist and physician, reported that this energy radiated from one person to another and could act at a distance. He believed it could purify the body and restore health, or could poison the body and cause disease. Dr. Van Helmont, the 17th century Flemish chemist and physician believed that energy could enable one person to affect another at a distance. Baron von Reichenbach, the famous German chemist, said that the energy could be stored and substances could be charged with it. The Chinese concept of Chi denotes “the natural energy of the Universe is spiritual or supernatural, and is part of a metaphysical belief system. Chi is thought to permeate all things, including the human body . Prana is the all-pervading vital energy of the universe, according to Hinduism. It is the Indian version of chi. Reiki is a form of healing through manipulation of ki, the Japanese version of chi. Rei means spirit in Japanese, so reiki literally means spirit life force. The Hahnemannian concept is elaborated by Dr. Kent when he speaks of the adaptive and constructive simple substance having formative intelligence which pervades, dominates and controls the material body. Quantity cannot be predicated of simple substance, only quality in degrees of fineness. Henri Bergson (1859-1941), French philosopher and Nobel laureate, who advanced a theory of evolution, based on the spiritual dimension of human life, had widespread influence in a variety of disciplines. He used the term “elan vitae” with similar sense. Orgone energy is an alleged type of “primordial cosmic energy” discovered by Dr. Wilhelm Reich (1897-1957) in the late 1930s. Reich claimed that orgone energy is omnipresent and accounts for such things as the color of the sky, gravity and galaxies. Reich believed that orgone energy is “demonstrable visually, thermically, electroscopically and by means of Geiger-Mueller counters. An aura, according to New Age metaphysics, is a colored outline, or set of contiguous outlines, allegedly emanating from the surface of an object. Auras are not to be confused with the aureoles or halos of saints, which are devices of Christian iconography used to depict the radiance of light associated with divine infusion. In the New Age, even the lowly amoeba has an aura, as does the mosquito and every lump of goat dung. As years pass by there was a gradual shift from vitalism to material science with advent of mechanical sciences. But the dawn of metaphysics, simultaneous with the shift from Newtonian Physics to Relativity theory, once again rejuvenated the concepts of vitalism formerly discarded. The first striking evidence of bio electric fields were made known to the world not by research but from the observation of some unusual cases. In 1879, a 19 year old girl from Canada was found to show electromagnetic properties after recovering from an unknown illness symptomized by convulsions. Any metal objects which she picked up were found to adhere to her open hand. One of the most systematic researchers in the field of measuring bio-electric fields was Harold Saxton Burr, M.D of Yale University. He said that every living system possesses an electrical field of great complexity which can be measured with considerable certainty & accuracy & shown to have correlations with growth & development, degeneration & regeneration, and the orientation of component parts in the whole system. 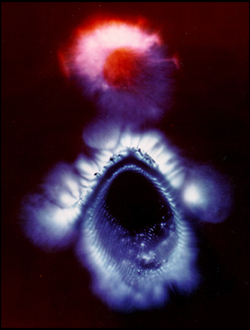 Kirlian energy field photography or High voltage photography was developed in the 1930s by a husband-wife team of scientists in Russia, Semyon & Valentina Kirlian. It is a means to visualize electro-magnetic fields around living things. All of us produce micro pulses of electrical charge every time we move, think or have an emotional response to something. It s a basic rule of physics that every electrical charge produces a corresponding electro-magnetic field. Any part of this electro-magnetic field can give meaningful information about the whole. The Kirlian camera uses electron cascades. The abundance of nerve endings produce strong electro-magnetic fields photographed as yriad dots of energy; jack-o’-lantern; and milky way. The left side of our brain deals mainly with analytical and logical thinking and the right one deals with feelings and emotional responses. The right and left sides of the brain tend to send some electrical micro pulses to the opposite sides of the body via the nervous system. So it is possible to see a visual representation of this brain activity by looking at a Kirlian energy field photograph. According to Prof. William Tiller of Material Science and Engineering Department at Stanford University, Kirlian photography could be explained with the concepts of corona discharge phenomena called streamers forming an avalanche and a cluster of positive ions with 1% speed of light. Since skin is strongly piezoelectric, an electrical stimulus will generate a mechanical resonance and vice versa. Changes in mental or emotional states should change the electron state population in the finger and thus reveal itself via altered emission processes. All other parameters such as changes in vasodilatation, temperature, skin conductance and sweat were found to have no effect on Kirlian discharges. The “electro-aurogram” of Dr.Gulyaiev, a sensitive device, measured the electrical field of a nerve from the human heart to be about 10 cm. He also noted that the electrical emanations around the body change according to health, mood & character. It can give information about the psychological condition of the individual. It can reveal a variety of psychological factors including the balance between the logical mind and the emotions. Unfulfilled potentials, stress, both past and present, suitability of environment, circumstances or relationships, psychic, sensitive and healing gifts can also be monitored. It is a valuable tool for monitoring the therapeutic effects of healing and other therapies. Parapsychologist Thelma Moss popularized Kirlian photography as a diagnostic medical tool with her books The Body Electric (1979) and The Probability of the Impossible (1983). She was convinced that the Kirlian process was an open door to the “bioenergy” of the astral body. The advent of newer and newer developments in science and technology will take the materialists to the promised land of truth where our master has already led us to. Destiny won’t allow this divine system to be treaded upon by any amount of skepticism aired , rather it will pave way for the realization of truths.